Amber Valletta made her way to the red carpet today(May 18th) for the 'Wonderstruck' premiere during the 70th Annual Cannes Film Festival in Cannes, France. 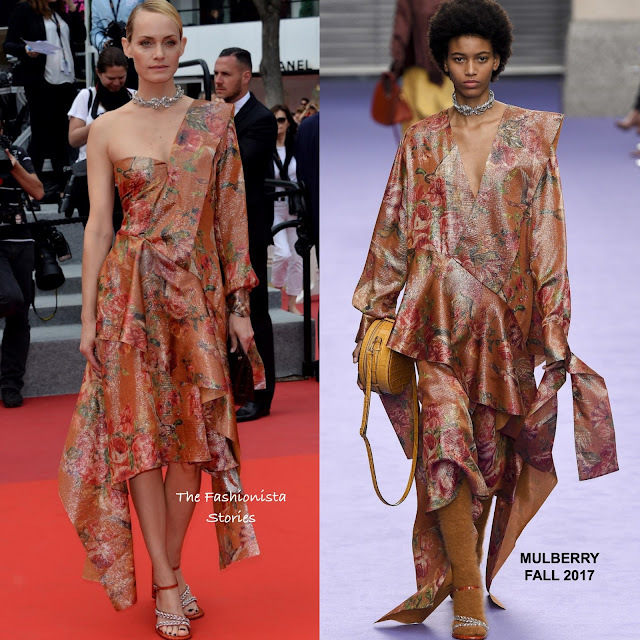 For the occasion, she wore head to toe MULBERRY FALL 2017 which featured a ruffled floral one long sleeve dress with an asymmetrical hem, a silver statement necklace, croc embossed clutch and embellished sandals. Amber's dress is a modified version of the runway piece and given her style, the modified dress worked better with it's modern top. Ensuring that nothing competes with her printed look, she went with minimal make-up and a slick, side parted bun which finished up her look.